I wrote a report for a demo and needed to include the report in a management pack. The SCOM 2007 way for including a report involved adding in the appropriate tags within your MP XML, and then pasting the code from the RDL into the MP. Fairly straightforward but kind of manual. In this scenario, I needed to include the report in a 2.0 schema MP. The SCOM 2007 tags no longer work, however, I believe including the report has actually gotten a little bit easier. The XML tags are similar to 2007 but slightly different. Rather than including the entire report definition, the solution can now just reference the RDL file. 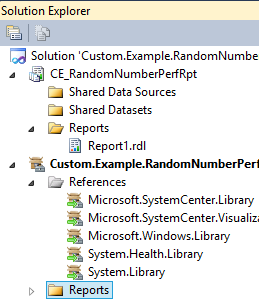 Notice the ReportResouce tag has an ID and it references the newly included RDL file. The ReportDefinition tag now just references the ID of the defined ReportResource. Only one thing left to change. Since the RDL has been added to the solution, it actually creates a copy of the file within the MP solution. The included RDL needs to be tweaked slightly in order to fix the data source. This is the same as 2007, but the nice call out here is that this does not break the original report solution as it leaves that RDL intact. It simply reflects the MPX from the VSAE solution. 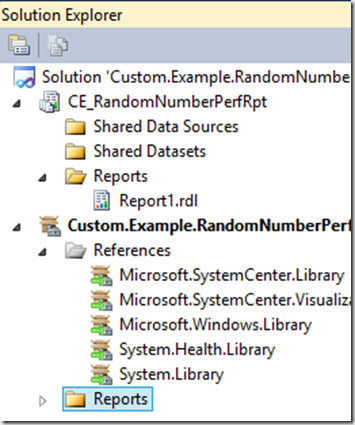 In order to get the report into SCOM, import the MPB file.